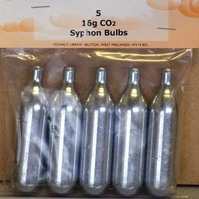 Sparklet type CO2 cylinders, packed 5's for use with Cornelius Kegs. Each cylinder contains 16gm of CO2 and needs to be used with the Cornelius Keg Injector/charger system. These DO NOT fit the standard red bulb holders and should not be used with our normal barrels. They also do not work with the Beer King Mini Keg Tap, for which the Brupaks bulbs should be used.